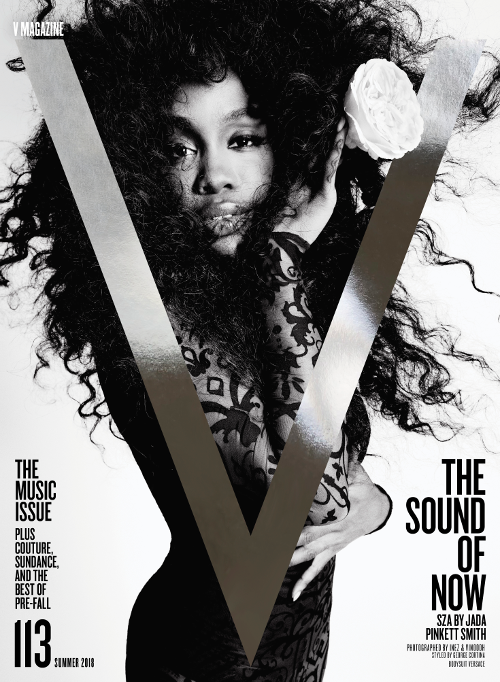 The “Love Galore” singer graces one of two covers for V magazine’s 2018 Music Issue. The issue promises to spotlight two of the most exciting newcomers in music for the May/June edition. SZA definitely fits the bill. By the way, Dua Lipa is on the other cover. The Grammy nominated singer got the chance to be interviewed by Hollywood titan Jada Pinkett Smith for the cover story. What a treat! Engaged in conversation with the YBF actress, the “Broken Clocks” singer talked about her artistic energy and how she just wants to love on and heal people. In regards to being a black female in the music industry, she was asked if she's dealt with misogyny, but she doesn't seem like the type to back down. "It’s tricky. I’m the only woman on my label. It’s tough, but I’m also not afraid. My mom has a hyper-femininity, but my dad is hyper-masculine. My daddy’s over six feet, bald head, 260 [pounds], he’s immense, but in the most beautiful way. He’s very powerful. It would take a lot for me to be afraid of you as a man"
"I feel like I don’t need a man to protect me. I love my dad. My dad is so masculine, so I feel like I’ve already experienced extreme hyper-masculinity. I’m not afraid of it, but nor do I welcome it. I’ve seen it go in that deep egoic space when it just gets like, you can’t hear me at all." You can read SZA and Jada's full exchange here. By the way, the TDE singer is already talking about retiring from music after releasing her debut album, CTRL, in 2017. "My world got so much smaller so fast. I have so much to write about. I feel like I’m in a cage," she told Flaunt magazine. She continued, "I’m making the best album of my life for this next album and I know that... because it’s going to be my last album" -- but apparently she delivered the news with a smile, which suggested she may or may not be serious about quitting. It's too early to quit SZA! We need your dope tunes. 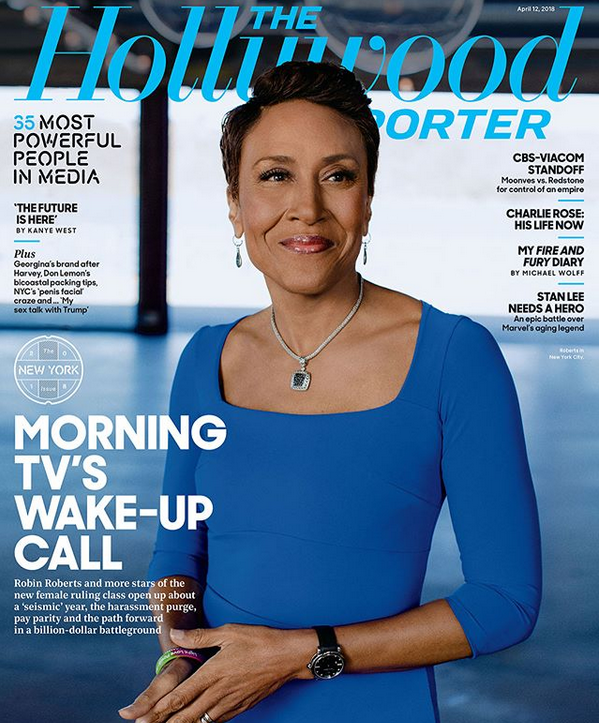 The (black) women we wake up to every morning are taking over the magazine circuit. 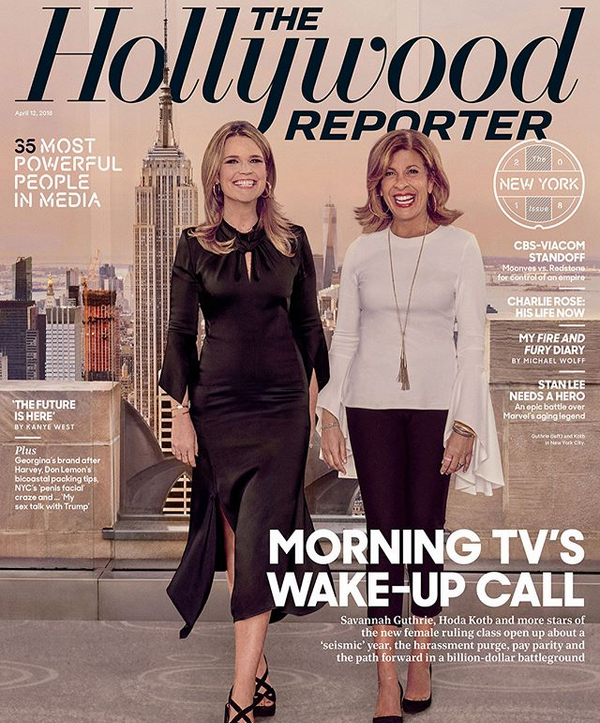 ABC’s Robin Roberts, CBS’ Gayle King and NBC’s Hoda Kotb nab their own covers for The Hollywood Reporter’s newest issue. They are joined by CBS’ Norah O’Donnell and NBC’s Savannah Gutherie. It’s been a rocky year for female TV personalities as their male counterparts have been accused of sexual assault, including the firing of CBS’ Charlie Rose and NBC’s Matt Lauer. The scandals have started a conversation across the nation about sexual assault and equal pay for women. Especially since women are now becoming more vocal about things rarely spoken about before. We're here for the fresh take on women's empowerment. ROBERTS I've been doing this morning show as an anchor since 2005; we now see two women prominently at the other two morning shows. Diane for a time was the evening anchor. We've had Katie Couric as an evening anchor and our friend Gwen Ifill at PBS, may she rest in peace. My sister Sally Ann just retired after 40 years in [local news]. And to see the old footage of her from the '70s, we've come a long way in what women are doing now in TV news. When CBS This Morning launched a little over six years ago, Charlie Rose was clearly the anchor with the most experience and visibility. But last year, both of you renewed your contracts with CBS. Was pay equity a priority for you in those negotiations? KING Well, I don't know what Charlie was making, and all I wanted to do was to make sure that I was well paid. When I first came, I felt they were taking a chance on me, even though I had done TV news for many, many years. I wasn't a novice. I certainly wasn't a media icon the way Charlie Rose was. So I didn't expect to make what Charlie Rose was making. But as time went on and I felt that I was bringing value to the table, I did expect to be paid what he was paid. Though I still don't know what he was making. O'DONNELL You are selling yourself short. You'd been on the air for 20 years in Connecticut. KING Oh, I know, but the thing is, unless you were in Connecticut or Kansas City, I was not a national name outside of being Oprah's best friend. And I don't run away from that, I'm OK with that. But it became clear to me that I was also bringing something to the table and I thought I should be compensated for that. And certainly I felt that way with the three of us. People got to the point, and they would say this to me, "The show is not the same without the three of you there." I heard that a lot. I never felt that one of us was a dominant person on the show. I thought that show worked because all three of us were very much in sync. And I expected that we should be compensated for that. Can you still engage in the male-female, sometimes flirty on-air banter, or do you have to tiptoe around that now? KOTB The guys who we have on our set are Carson [Daly] and Al [Roker] and Craig [Melvin], and their sense of humor is not that. Al's like your crazy uncle, Carson's your best guy friend. I hug Craig when I see him. We don't feel like there's a new set of rules that we cannot be ourselves. The #MeToo movement has focused people's attention on the retrograde gender roles that have existed for so long, and not just in TV news. Where do you think this discussion goes? ROBERTS I think it's to be determined. When you see what we saw [on March 24 with the March for Our Lives], these aren't the same times. People are speaking up, whether you're a woman that's saying "#MeToo," or a man who is saying "#MeToo," or you're a kid saying "enough." So I hope we don't go back to business as usual. Being a little bit older, there was a part of me at the beginning going, OK, how long is this going to last? But I am an eternal optimist, and I think this time it's different. KING I call 'em Wakanda Nation moments. It's really important for women, minorities, to see people that look like them doing things that you go, "I want to be like that." And you can use your voice. Girls coming up today, I'm excited for them. They're not gonna take crap. 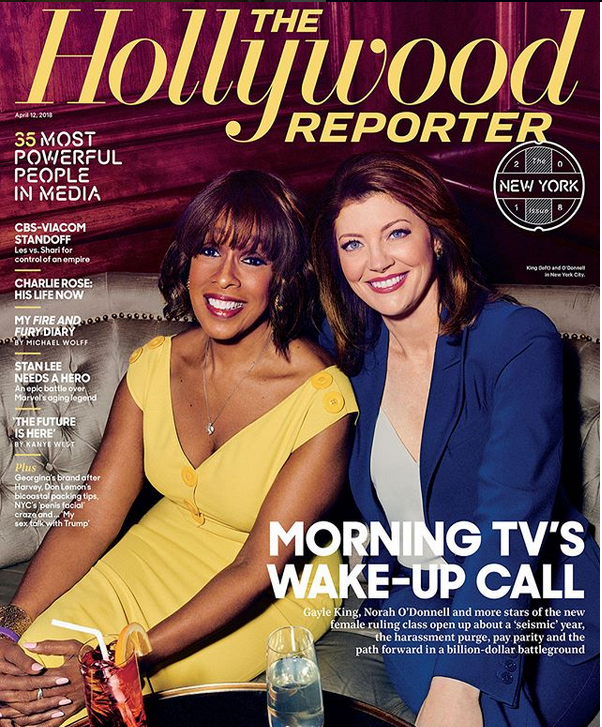 Cover girls Gayle and Hoda hit up The Hollywood Reporter's Most Powerful People In Media bash at The Poolin NYC. NEXT: WE SEE YOU: Nicole Murphy & Bu Thiam On A Lunch Date?